As you may already know, Microsoft is pretty strict about who it allows to make third-party controllers for the Xbox 360. So, instead of partaking in an extended licensing battle with Microsoft, some companies choose to come up with controller modifications instead. I thought that the upgraded thumbsticks from Evil Controllers were already pretty neat, but the crazy kooks at KontrolFreek seem to be stepping it up to a whole new level with the FPS Freek and Speed Freek. Get ready to get your freak on. Both the FPS Freek and the Speed Freek are thumbstick upgrades that snap onto your existing Xbox 360 controller. Unlike the solution from Evil Controllers, you don’t have to take your gamepad apart. The attachments click into place over top of the existing thumb sticks. As its name implies, the FPS Freek is designed for games like Halo and Call of Duty. The idea is you get enhanced aiming precision by way of the added analog stick length. This won’t come in handy for games like Tekken 6, but you’ll find that you can be more accurate with a sniper rifle in your first-person shooter of choice. The longer stick makes for 40% more linear travel from full stop to full stop, so you can be more precise with your movements. It does take some time to get used to this increased travel, but I did find that I could be more precise with my targeting in Gears of War. The added travel does make gaming a little more tiring though. Whereas the FPS Freek will help you get those headshots, the Speed Freek modification is meant to get you to the front of the pack. When playing racing games, you typically have to provide some downward force on the thumbstick as you maneuver around the track. By adding on the “winged” design of the Speed Freek, you only have to push on those wings to turn left or right. Trying this out in Forza Motorsport 3, I enjoyed the Speed Freek experience from a subjective standpoint, but I seemed to spin out and have more extreme “out of control” moments with this attachment. Your mileage, no pun intended, may vary. MegaTechie Performance or MegaTechie Useless? 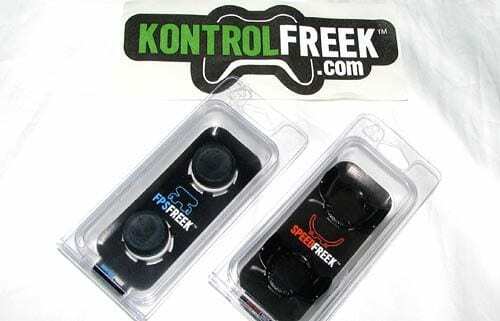 Each pack comes with a pair of control stick attachments, so you can slap them onto both the left and right analog sticks on either the Xbox 360 or PlayStation 3. Either the Speed Freek or the FPS Freek sell for $10 on their own; alternatively, you can buy the KontrolFreek Combo Bundle for $18. In terms of changing your gaming experience, I can say that using the FPS Freek or the Speed Freek in their respective target genres of games can make quite a difference. The added precision of the FPS Freek is surprising, but I didn’t really get the same added performance with the Speed Freek. At only ten bucks each, the Kontrol Freek mods are worth giving a try. The Speed Freek won’t replace a racing wheel, but it can be a step in the more comfortable direction.